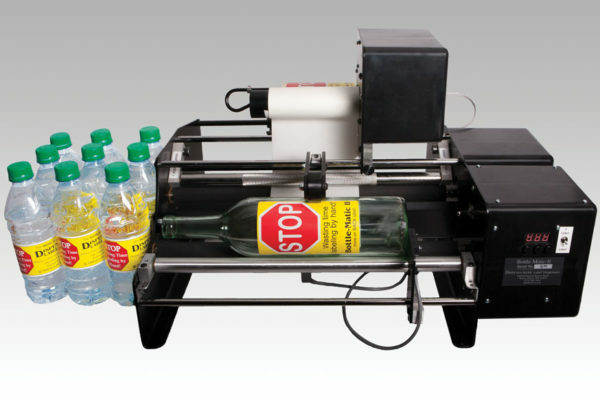 Bottle-Matic-II bottle labelers enable the user to label all kinds of cylindrical objects front and back by simply setting the desired spacing using the index knob. Then insert the container and pressing a foot switch. Once the foot switch is activated the label is applied, then the machine inserts a gap that was set with the index knob, and immediately applies the 2nd label. Most wine bottles are labeled in less than 5 seconds! This allows the user to quickly remove the bottle and insert another to start the procedure again. Once a rhythm is established bottles are labeled VERY quickly. Loading is a “snap”, just feed the labels between the dispensing tables then through the patented feed-roll assembly and “snap” into place. Gap adjustment is quick and easy, turn the knob to the desired gap in inches to 100th of an inch. ACCURACTE! Can hold repetitive gap spacing to 1/16″ or less on most containers. Holds 1/64th” side-side accuracy on most containers.